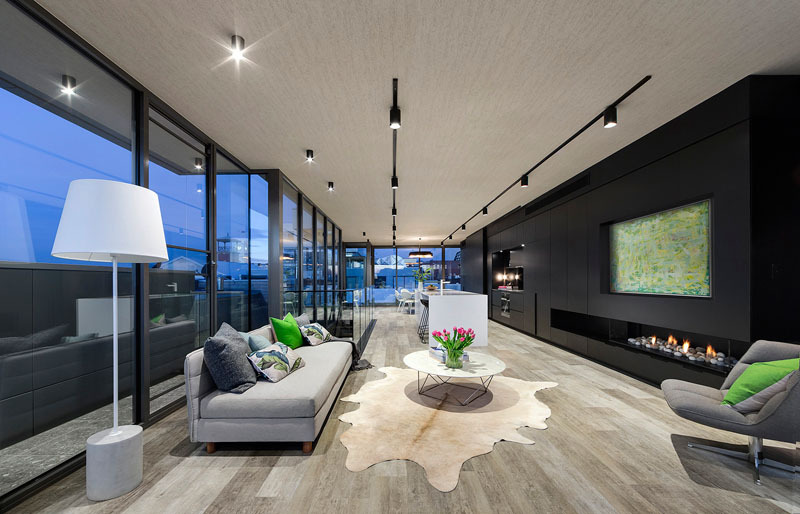 A warehouse was transformed into a stunning contemporary home. We have seen many home conversions and they are all impressive. We have seen a factory turned into a home or even churches. It is also common for some warehouse to be transformed into a home especially that it is spacious and has tall ceilings. So, no wonder that there are many homes that are actually warehouses before. Today, we are going to show you another house that is a conversion from a warehouse. Although there are already many transformations like this, notice that each one has a different approach and they all turn out to be beautiful and cozy. Also, one reason why every home is different is because of the varying design preference and lifestyle of the owners. 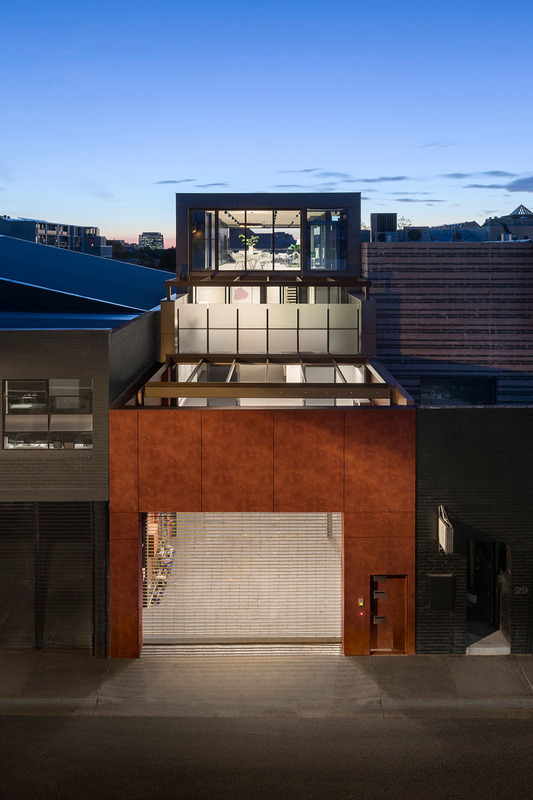 This warehouse conversion is a project by LSA Architects called Vista Prahran. The space which was once an old warehouse in Melbourne, Australia is now a contemporary, light-filled home. Aside from the interior which has a modern appeal, the interior looks really beautiful using contrasting colors of black and white. I also love the gold accents in the dining area and how it added plants in the interior to bring a refreshing aura into it. For sure, if you will see how the interior looks like, you will love it too. Scroll down and take a look at the house below. Unique feature: A warehouse renovation which turned out very beautiful resulting into a light-filled contemporary home with a stunning and cozy interior. This is the exterior of the house. Who would expect that it was actually a warehouse before? Love the design of the facade which is simple but has a hint of elegance. Because of the glass windows used in the upper area of the house, it is transparent from the street. The home has a top floor full of glass which is a good idea to bring light into the house. You can also get a glimpse of the lower portion which used glass as well. Aside from making the area light-filled, it also allows the owners to take a look at the city around it. Seen here is the living area with pops of green in it. 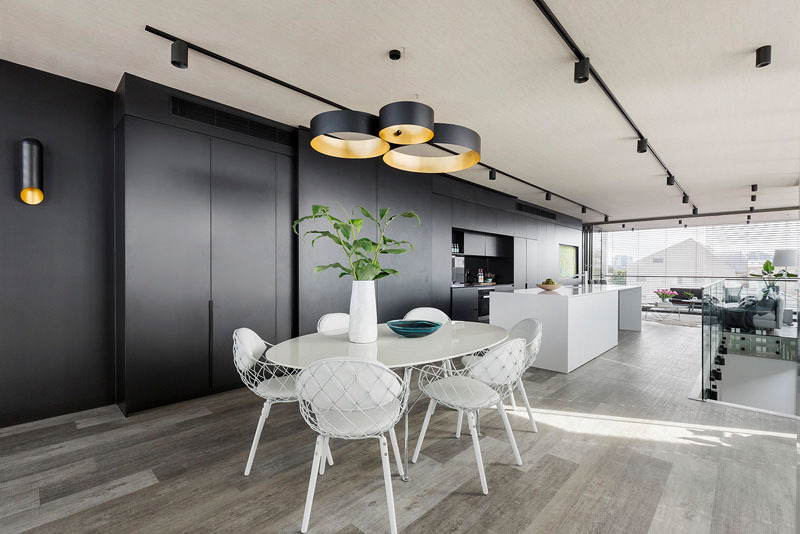 As you can see, there is a black wall system that connects from the living space to the dining area. Now that sure is a lot of storage! It also holds a modern fireplace and a television. 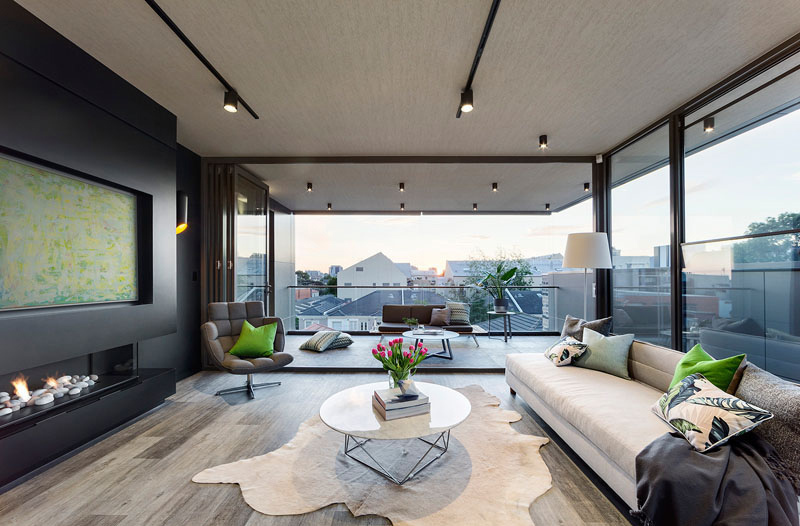 I love the design of this living room which looks sophisticated but not overly designed. At one end of the top floor is a balcony with views of the neighborhood. It is nice that the balcony can be easily accessed from this lovely living room. During the night, the area can be closed with the folding glass doors. Next to the living room is the kitchen with a long white island which also doubles as a storage space. It has a contrasting black wall of cabinetry which keeps everything one needs for the kitchen like the cooking area and lot of storage. 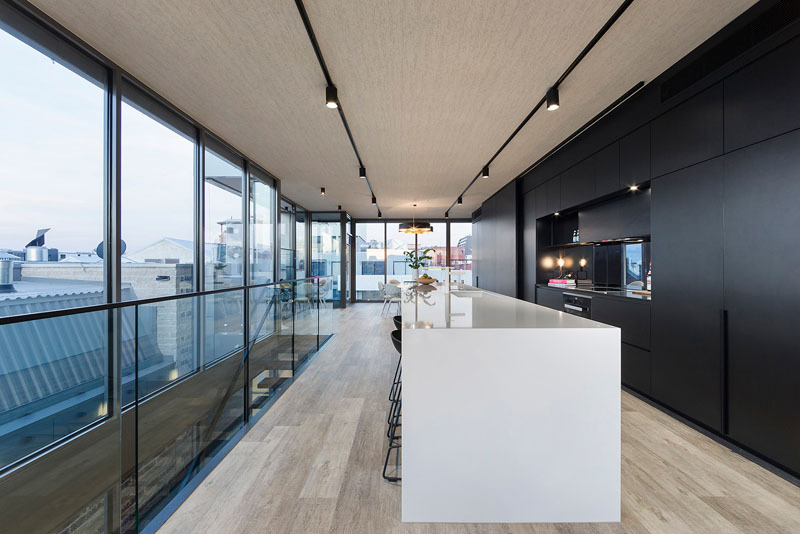 The kitchen features a long white island contrasting the black wall of cabinetry. It has wooden flooring and track lights in the ceiling. 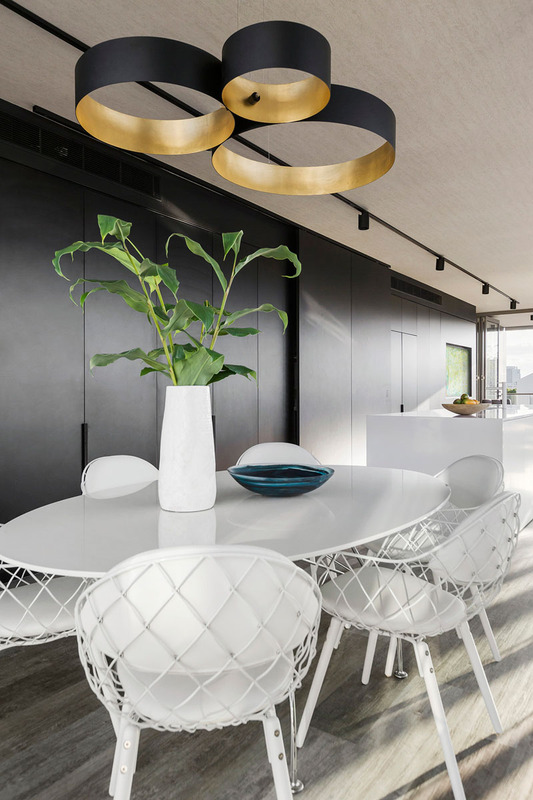 The white dining table matches the white kitchen island, and the black and gold pendant light matches the black and gold sconce on the wall. Such a stunning combination indeed and it is a good idea to add plants in the space too. 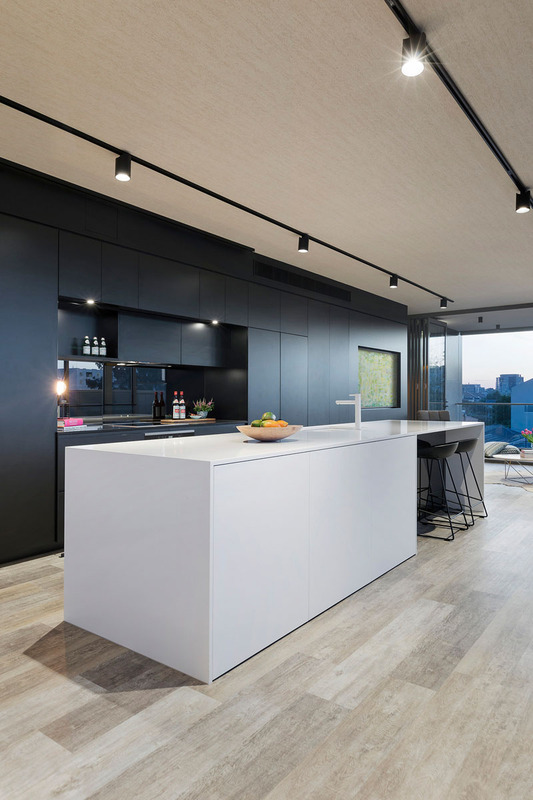 One of the key features in this area is the black wall of cabinetry which has a sliding panel that can cover part of the kitchen up when you don’t want it on display. I also like the design of the chairs used in here. 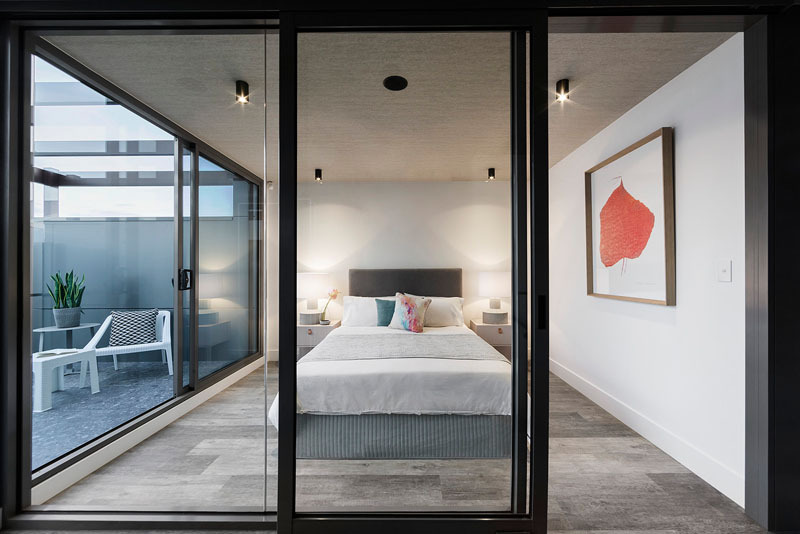 One of the bedrooms has glass walls that allow plenty of light into the room. It also has a small private balcony to the side which can be accessed through a sliding glass door. You can also see here that the bedroom has wooden flooring and beautiful yet simple desk lamps on both sides of the bed. This is a look at the home’s staircase which is one of the highlights of the interior. It used black steel and dark wood stairs that would lead you to the lower levels of the home. The stairs also have glass materials around it as well. 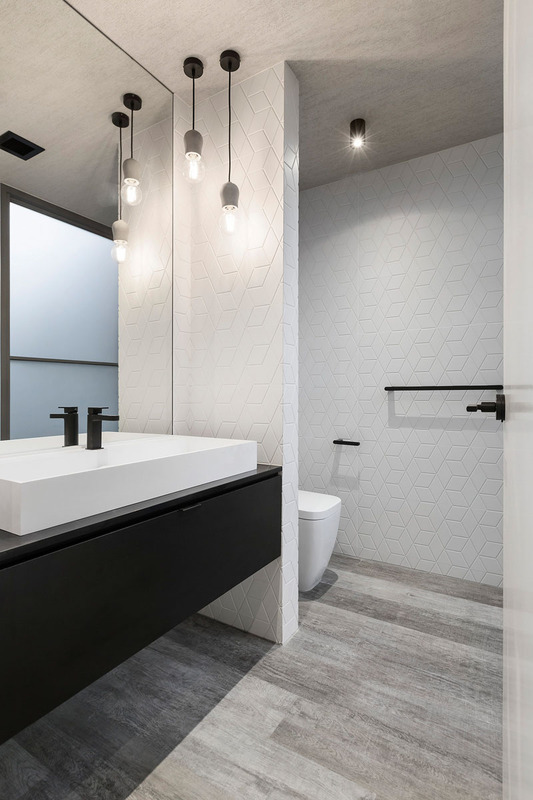 Here’s a look at one of the bathrooms in the house featuring black and white colors. Notice that it has a large mirror in it that helps to distribute light in the space. And it also has a plant in it as well. Another bathroom in the house that features a white bath tub. 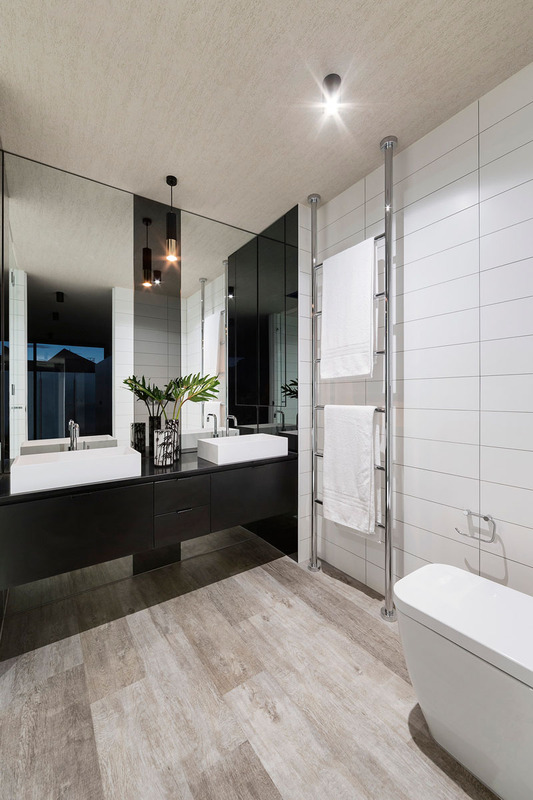 This bathroom has glass features for its shower enclosure and made use of contrasting colors black and white. It also has wooden elements in it as well. 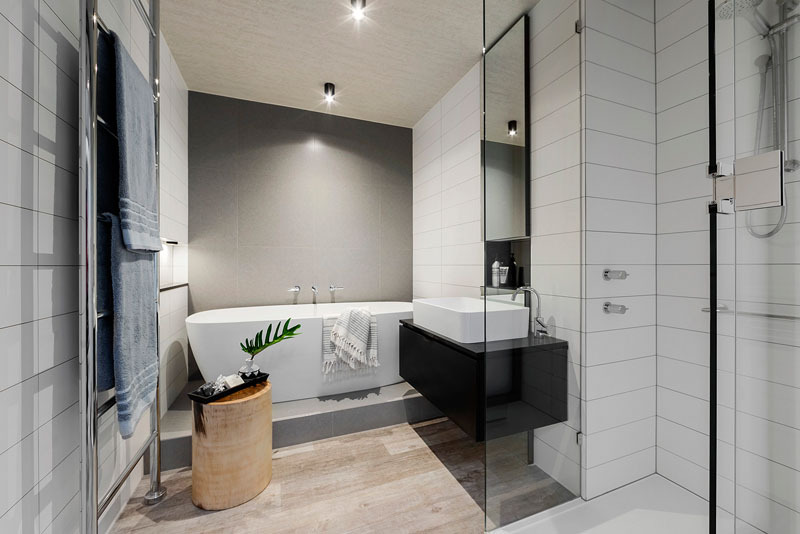 What is notable in this bathroom is the textured wall in white that brings a different level of appeal to the space. You can also see here the black colors of the vanity as well as its lovely yet simple lighting. 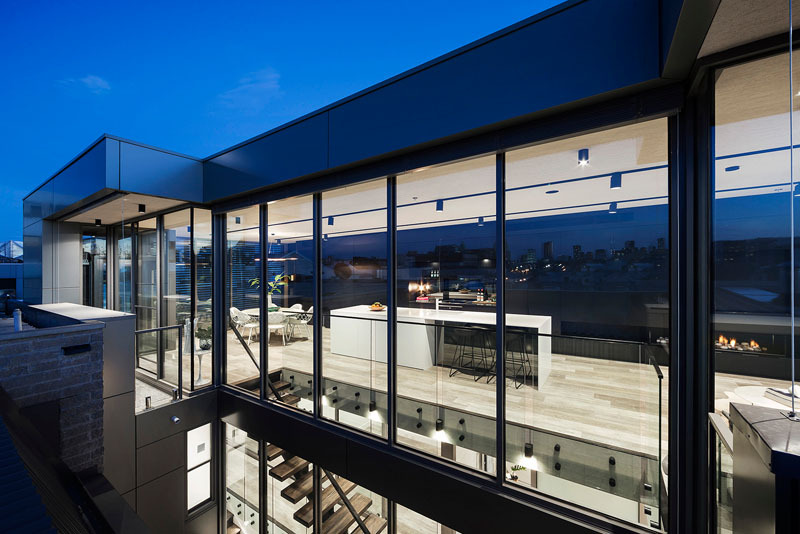 I am sure that you will agree with me that what LSA Architects did to this warehouse is definitely amazing and totally stunning! You can see the change from the exterior to the interior of the house and it is really something that will make us realize that indeed anything can turn into something very nice with creativity and style. And we have seen that in this warehouse conversion. There are also other homes that were once warehouses that we have featured here on Home Design Lover. Go ahead and check them out!